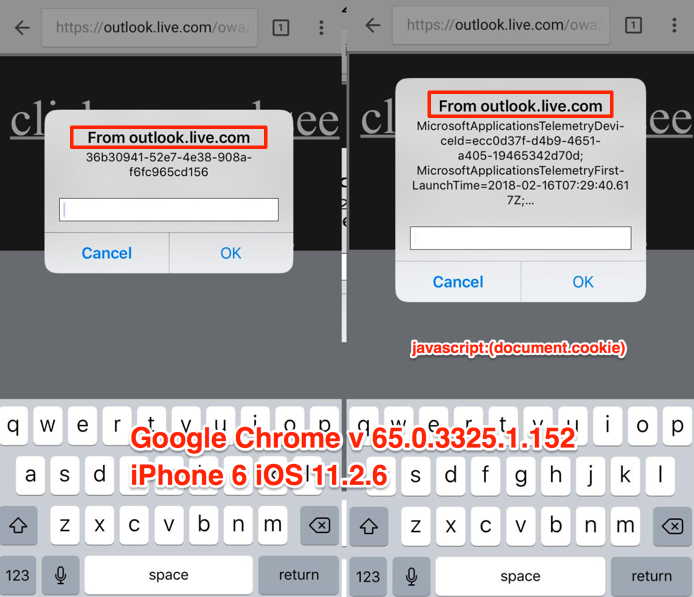 ​4​ .- Open the link directly ​in Chrome iOS browser , click the hyperlink and ​ see​ the XSS (shows up ​again ​ the document.cookie) ​, ​ if you open the link in any iOS browser like Safari, Firefox, Chrome, Opera the XSS works, you just need to be logged in your ​outlook account, only works in iOS). Stored XSS allows an attacker to embed a malicious and arbitrariness scripts into a vulnerable page, which is then executed when a victim views the page. My personal email account and all testing was sending emails to myself. We like to congratulate to Omar Espino for its great find.